What size of prop should I put on my Fly Baby? Seems like that should be a very simple question to answer, shouldn't it? But it isn't. While prop manufacture, itself, is surprisingly straightforward, prop design isn't. And, by extension, finding the right prop for your Fly Baby isn't either. First, let's get some definitions out of the way. Props are identified by their diameter and their pitch...as in "72/48". Diameter is easy enough...just the distance from tip to tip. 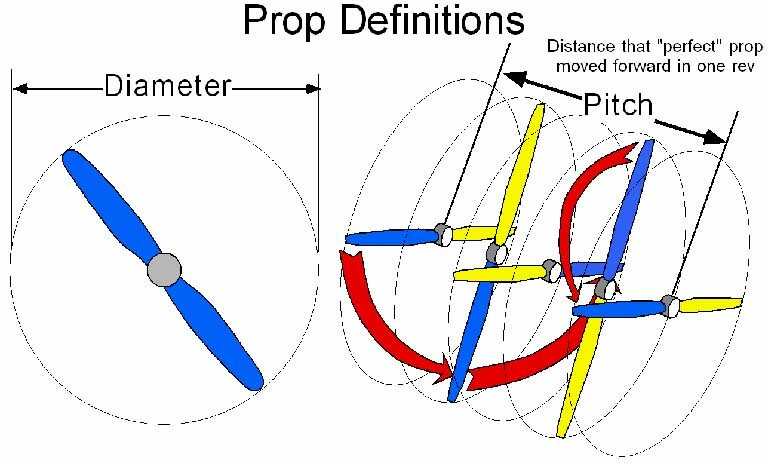 The pitch is a bit more complex, but still pretty simple: It is the distance the prop would move forward in one revolution, assuming it has perfect "bite" into the air. Imagine the prop as a screw going into wood. If the screw goes 50" into the wood with one rotation, that's a 50-inch pitch. If both have the same diameter and pitch, one propeller should be the same as another, right? All three props are the "same," from the marketing point of view. But obviously, they won't generate the same thrust! And hence, here is where the difficulty lies: The pitch definition assumes the prop has perfect "bite" into the air, but in the real-world, these three props will actually grab the air quite differently. The middle prop will probably grab so MUCH air that the engine will lug down and won't produce maximum power. And the one on the right will probably be less effective than the typical ceiling fan. The one on the left might be OK...but a similar prop with less chord might not. The fact is, there is no propeller specification that establishes how efficient a given propeller is...that is, how well it produces engine power to thrust. Without a specification...comparing propellers between manufacturers is meaningless. If the owner of Fly Baby N100A replaces his 70x43 prop carved by Joe Smith with a 70x43 built by Ed Jones, the chances that the airplane will perform the same are very small. Smith's may have broad blades, but Jones may have a skinnier design intended to allow the engine to turn up to full RPM. Take a look at the Propeller section of the Fly Baby owner's survey. You will see a surprising variation in the propeller specifications for the same engine. This indicates how the props vary between manufacturers. With all the above, using one of the modern ground-adjustable props seems like it'd be perfect. Right? Not hardly. As the above might indicate, there's more to a propeller than just a twisty bit of wood, metal, or composite. The ability change the prop pitch doesn't overcome other shortcomings. 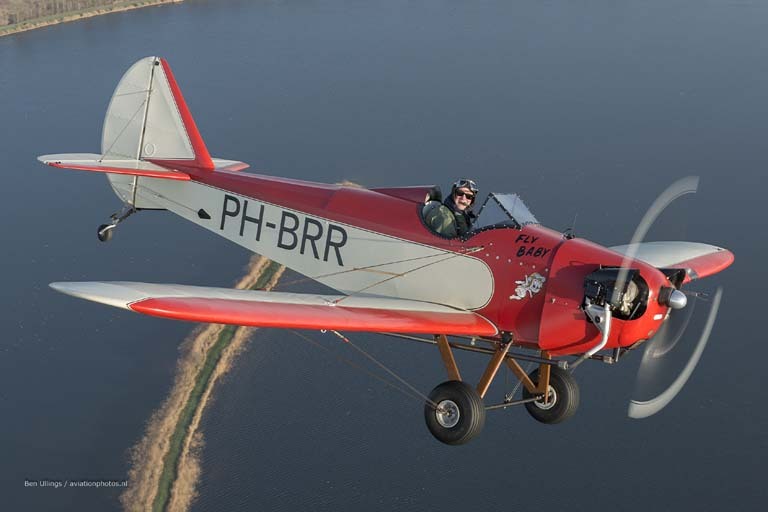 In April 2018, Hans Teijgeler posted a great summary of this issue to the Fly Baby Facebook page. With his permission, here's a summary. A prop is not just meant to slow down an engine, but should first and foremost generate thrust. A propeller sees the airstream hitting at various angles along the length of its blades. There is the forward motion of the aircraft, resulting in a uniform front to rear flow all along the blade, and the rotation of the blades that results in near zero speed over the blades at the center and up to Mach .75 or .8 at the tips. Combined, you'll get an interesting air flow, where the air flow coming from the forward motion of the aircraft predominates at the prop hub, and the effects of the rotational motion get more and more important the closer you get to the tips. A prop being an airfoil, you really want the angle of attack to be as close to optimal as possible. And thus to accommodate this airflow you need a hefty washout along the blade length, with the blades flattening out towards the tips. The amount of washout being very much depending on the typical forward speed of the aircraft. 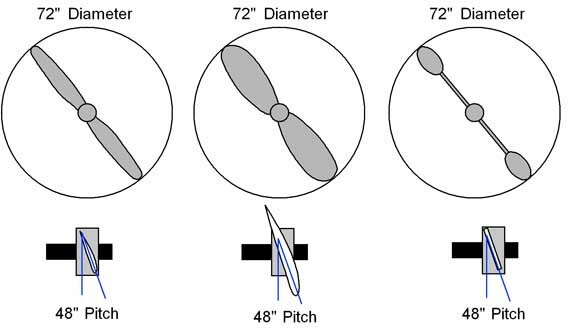 A fast aircraft will still require the tips to be at a fair angle, whereas a slow aircraft will need them much flatter, with the difference between them reducing the closer you get to the prop center. So as Hans points out, just because the overall pitch of the blades are adjustable, the washout of the blade still won't necessarily be optimized. Hans uses an MT Propeller on his Jodel (which has a higher speed range than his Fly Baby). He points out that his MT Prop does include an adjustment for blade washout, as well as overall pitch. He has also flown another model of ground-adjustable propeller that does not include adjustment for blade washout. He had to run the engine with five additional inches of manifold pressure to reach the same performance level as his MT propeller with the washout setting optimized. The other prop was significantly less efficient. As a final note, at least one of the makers of ground-adjustable propellers doesn't recommend their use on direct-drive engines like Continentals. So, how do you pick a prop? If someone else's Fly Baby is running a certified prop and your Fly Baby has the same engine, you should be able to run the same model of propeller. Otherwise, though, it's actually pretty easy: You don't have to know what the propeller specifications should be. Instead, just tell the propmaker what you have, and want you want. "I've got a Bowers Fly Baby mounting an A65 with a tapered crankshaft, and I'd like a climb prop." Most prop carvers have built units for Fly Babies before, so should have a good idea of the proper diameter and pitch for their particular blade shape(s). In most cases, wooden prop makers are able to do some amount of adjusting even after they deliver the prop. They'll send you the prop, and have you test fly it. If it's not letting you climb fast enough or cruise is too slow, they can then re-shape the blades accordingly. Make sure you discuss the ability to make changes as you discuss the prop with the carver. The Sensenich web page includes a lot of great technical information on propellers.